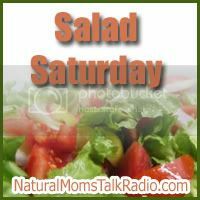 Each Saturday I’ll post a free salad recipe from my new salad cookbook. It ha s over 365 recipes, so you can either buy it now or just hang around here for the next 6 years. LOL! In a wooden salad bowl, mash garlic and salt with a strong fork. Add fresh artichoke hearts, and mash with the garlic and salt. Add olive oil, stir, add lemon juice, stir, add wine vinegar, stir, stir, add hot sauce, stir, add Lea & Perrins Worcestershire sauce, Mix well. Put canned artichoke hearts in dressing and let marinate for 1 hour then eat as is or serve on a bed of greens. Carrie is a work at home, homeschooling mom of 4 who loves to discuss all aspects of pregnancy, natural birth and alternative birthing options, breastfeeding, alternative health, home schooling, nutrition and natural parenting topics. Natural Moms Talk Radio is powered by WordPress.